Every year there is a “game of the century” and this year this game was it. Texas A&M gave Alabama their only loss in 2012. It was that win that propelled Johnny Manziel to the Heisman Trophy. Although Alabama recovered and won the BCS Championship, it was obvious they were focused on this game. This year the game was played in week three, so Alabama got their chance for revenge early. In 2012, the Aggies got off to a quick start, putting Alabama down by 20 points before they even knew what hit them. This game started off looking like a repeat performance. A&M received the opening kickoff and stormed downfield, scoring a touchdown in 7 plays, only taking 2:39 off the clock. The big play of the drive was a pass from Johnny Manziel to Mike Evans covering 35 yards. The score came on a 1 yard pass from Manziel to tight end Cameron Clear. After a 3 and out by the Crimson Tide, the Aggies struck again. Evans again beat the Crimson Tide secondary deep and Ben Malena took it over from 1 yard out to make it 14-0 with only a little more than 7:00 off the clock. The Crimson Tide knew they had to get a score on their next possession or things could get out of hand quickly. Alabama QB A.J. 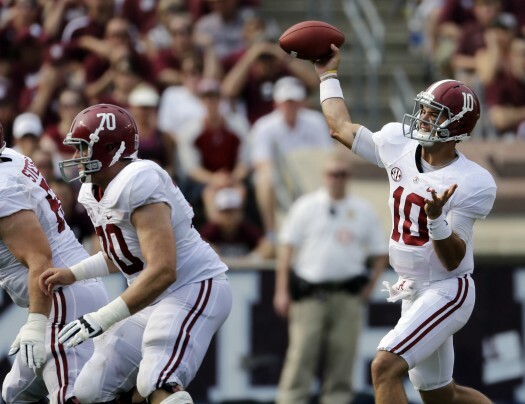 McCarron began to successfully attack the Aggie secondary. Using the passing game, they moved the ball downfield and scored on a 23 yard leaping catch by Kevin Norwood to cut the lead to 14-7. On the kickoff, the Aggies were pinned deep when kick returner Brandon Williams fumbled the ball out of bounds at the 2 yard line. A&M was able to move the ball to the Alabama 48, but then the drive stalled and they had to punt the ball back to the Crimson Tide. The first quarter ended with the Aggies on top 14-7. On Alabama’s first possession of the 2nd quarter, they struck quickly on a 44 yard flea flicker from McCarron to junior receiver DeAndrew White. The TD tied the score at 14-14. When the Aggies got the ball back, they moved the ball well. It looked like The Crimson Tide had a defensive stop on 3rd and 8, but Alabama defensive end Jeoffrey Pagan missed a sack and Manziel heaved the ball down the middle of the field into coverage. It probably should have been intercepted, but Aggie receiver Edward Pope made a great play on the ball in a crowd to get the first down. A&M drove to the 4 yard line, but Manziel was picked off in the end zone by cornerback Cyrus Jones. Alabama took advantage of the turnover, taking their first lead. McCarron hit receiver Kenny Bell on a screen pass and Bell slipped a tackle and raced 51 yards down the sideline to put the Crimson Tide up 21-14. After forcing an Aggie punt, Alabama took over at their own 7 yard line. The Crimson Tide finally got their running game going and they drove 93 yards in 11 plays to take a 28-14 lead on a 4 yard run by T.J. Yeldon. The drive took 6:23 off the clock and left the Aggies with only :45 before the half. Manziel hit a couple of passes, but on the last play of the quarter, he hit Malcome Kennedy over the middle and the clock ran out. Alabama got the ball first in the 3rd quarter had a chance to put the Aggies down by three scores, but they went 3 and out on their first possession. However, on the Aggies first possession of the half, Alabama safety Vinnie Sunseri intercepted Manziel and returned the ball 73 yards for a touchdown and 35-14 lead. On the following kickoff, return man LaQuvionte Gonzalez gave the Aggies good field position, returning the kick to his own 42 yard line. The Aggies used their running game and a pass interference penalty to move the ball to the Crimson Tide 14 yard line. From there, Manziel hit receiver Malcome Kennedy for the touchdown and narrowing the lead to 35-21. Alabama continued to move the ball at will against the Aggie defense, driving 83 yards in 10 plays and taking 5:17 off the clock. Sophomore running back Kenyan Drake took it over from 3 yards out, extending the lead to 42-21 which was the score going into the final quarter. With only 15:00 left and down by three scores, the Aggies needed a near perfect quarter to get back into the game. Manziel drove them quickly down the field on their first possession, going 80 yards in just four plays. Malcome Kennedy caught his second touchdown pass of the day to cut the score to 42-28. After the kickoff, the Crimson Tide started working the clock. Using the running game almost exclusively, they drove all the way to the Aggie 1 yard line. T.J. Yeldon committed a costly error, fumbling the ball inside the 3 yard line and A&M linebacker Shaan Washington recovered. A score of any kind at that point would have made it a 3 score game again with almost 9:00 left. However, the fumble gave the Aggies new life and they capitalized. On the third play after the fumble, Manziel dropped back to pass from his own end zone and heaved a pass down the right sideline for Mike Evans. Evans came up with the ball and raced all the way to the end zone to complete a 95 yard play and cut the score to 42-35 with 8:04 left. The Aggies, however, kicked the ball out of bounds on the kickoff, giving Alabama good field position at their own 35 yard line. The Crimson Tide again worked the clock, driving to the A&M 5 yard line. From there, McCarron rolled to his right and found running back Jalston Fowler for the score and making it a two possession game again with 2:28 left. Manziel continued to battle as he had done all day. He took his team 75 yards on 10 plays and Malcome Kennedy caught his third touchdown pass of the day to cut the score to 49-42 with just :15 left. The Aggies attempted an onside kick, but Alabama recovered to seal the win. Alabama was able to get their revenge, but it did not come easy. The normally stingy Crimson Tide defense, gave up 42 points. Manziel may not have gotten the win, but he attacked all day long and did not give up, even when down by three scores. The win gives Alabama a leg up on the rest of the SEC West, but both teams have to be concerned about their defense after this game. The Crimson Tide is known for a stout defense that keeps the score manageable, but they gave up 464 yards passing and 42 points. The Aggies defense also struggled, giving up 568 yards of total offense and 49 points. Alabama should have an easy home game this week against Colorado State. The Aggies have a home game against SMU which should be winnable, but you can never count out the high powered Mustang offense. A.J. McCarron, QB, Sr: Three year starter. Takes care of the ball. Has only thrown 9 interceptions in his entire career. Very good on play action passes and bootlegs. Throws a nice deep ball. Great leadership abilities. Completed 20 of 29 for 334 yards (career high) and 4 TD. Jalston Fowler, RB, Sr: Big 250 pound bruiser. Can play running back or H-back. A battering ram that likes to pound at the defense. Good burst for big man.. 4 carries for 37 yards, including a 15 yard run. DeAndrew White, WR, Jr: Dependable receiver with good field awareness. Led the team with 4 catches for 82 yards, including a 44 yard TD on a flea flicker. Kevin Norwood, WR, Sr: Great leaping ability and body control. Has the ability to catch the ball at its highest point, above the defender. Had 3 catches for 32 yards. His 22 yard leaping touchdown grab was a thing of beauty. Kenny Bell, WR, Sr: Good open field running ability. Good speed. Had a 51 yard touchdown off of a screen pass. Christion Jones, WR/KR, Jr: Good return man. Had 35 yard kick return. Blocks well in the running game. 1 catch for 12 yards. Cyrus Kouandjio, OT, Jr: Big 6’6” 310 pound tackle. Second year starter. A good drive blocker. Sets the edge well on outside runs. Anthony Steen, G, Jr: Gritty. Efficient player that rarely makes a mistake that hurts his team. Key to the inside running game. Jeoffrey Pagan, DE, Jr: Missed on a big third down sack that lead to Manziel escaping and throwing for a 1st down. Had 4 tackles. Adrian Hubbard, OLB, Jr: Good pass rush skills. Led the team in 2012 with 7 sacks. Has the versatility to drop into coverage. Dropped an interception. 3 tackles, 2 passes broken up. John Fulton, CB, Sr: Tough afternoon. Was beaten twice by Mike Evans for a 32, 35 and 34 yard catches. Pass interference penalty. Had 4 tackles. Vinnie Sunseri, S, Jr: Always around the ball. Makes the calls for the secondary. Good concentration. Once he gets his hands on the ball, he’s a threat to take it all the way. Had 4 tackles and a 73 yard pick six off of a tipped ball. Jarrick Williams, S, Jr: Missed the entire 2012 season with knee injury. 2 tackles, 1 tackle for loss. Tipped a pass that was intercepted and returned for a touchdown. Had horse collar penalty. Ha Ha Clinton-Dix, FS, Jr: Ball hawk. Plays the ball well in the air. Had 6 tackles. Nick Perry, S, Sr: Good blitzer. Had 1 batted pass. Johnny Manziel, QB, RS Soph: Fast and very athletic. At his best when he is improvising. Very aggressive. Pushes the envelope. Big Arm. Tough to sack. Doesn’t give up. Carries the ball out away from his body, making it vulnerable to be knocked away. Can get sloppy with his mechanics. Undisciplined. Tends to hang the ball up in the middle of the field. Completed 28 of 39 for 464 yards with 5 TD and 2 INT. Continued to rally his team from behind. Ben Malena, RB, Sr: Versatile. Good runner. Able to run pass patterns downfield. Returns punts. Great body control. 11 carries for 42 yards and 1 TD. 3 receptions for 26 yards. Mike Evans, WR, RS Soph: Big 6’5” body. Former basketball player. Uses his body to box out defenders. Mismatch against most defenders. Good strength and speed. Great game. 7 catches for 279 yards and 1 TD. Had receptions of 32, 35, 34 and a 95 yard TD. Darel Walker, WR, Sr: Good on screens. Has ability to make people miss. Tough to bring down. 5 catches for 66 yards. Malcome Kennedy, WR, Jr: Second on the team with 13 receptions. Career day with 3 touchdowns. Had 6 receptions for 57 yards. Cameron Clear, TE, Jr: JC transfer. Big body, 6’6” and 270 pounds. Red zone threat. 1 catch for 1 yard and 1 TD. Jake Matthews, OT, Sr: NFL bloodlines. Son of Titan’s O-line coach Bruce Matthews. Versatile player that has played on the left and right side. Has great protection technique and dominant upper body strength. Steven Jenkins, LB, Jr: Suspended for first two games. Constantly around the ball. 13 tackles, 1 tackle for loss. Forced a T.J. Yeldon fumble that kept his team in the game. Deshazor Everett, CB, Jr: Had game saving interception against Alabama in 2012. Tough against the run. Good form tackler. 9 tackles and 1 pass breakup. This entry was posted on September 17, 2013 by draftmaniacs in Uncategorized and tagged 2014 NFL draft, A.J. McCarron, Alabama football, Johnny Manziel, NFL, NFL Draft, Texas A&M football.